When it comes to shattering preconceptions, Mazda isn’t the first brand you’d think of – but that’s exactly what the Japanese firm is claiming its new 2 will do. It's Mazda that continues to champion the super-smooth rotary engine, and though the MX-5 isn’t particularly radical, few other modern cars have established such a legacy. The 2 isn’t likely to find quite as many followers as the MX-5 but it is as unconventional as Mazda gets, eschewing the conventional ‘built to a budget’ ethos found in many sub-compact superminis for a luxury-in-miniature concept. Right-sized engines, interesting design, high levels of active safety and a generous standard specification set to make it stand out against the Ford Fiesta, VW Polo and Skoda Fabia. 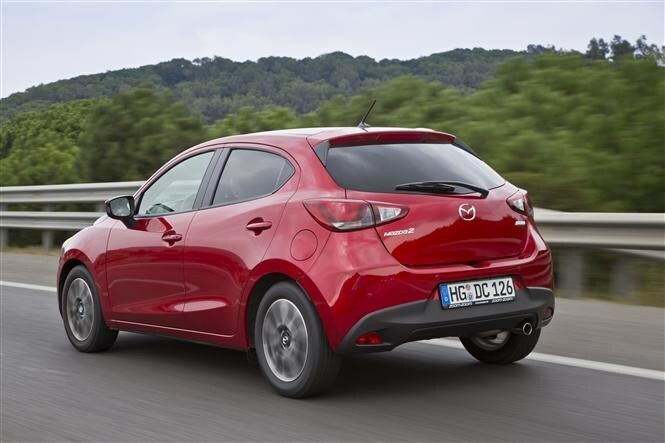 Where others plough furrows with tiny triple-cylinder turbocharged engines, Mazda is offering just one petrol and one diesel, both 1.5-litres in displacement and each with four cylinders. Only the diesel makes do with a turbocharger. 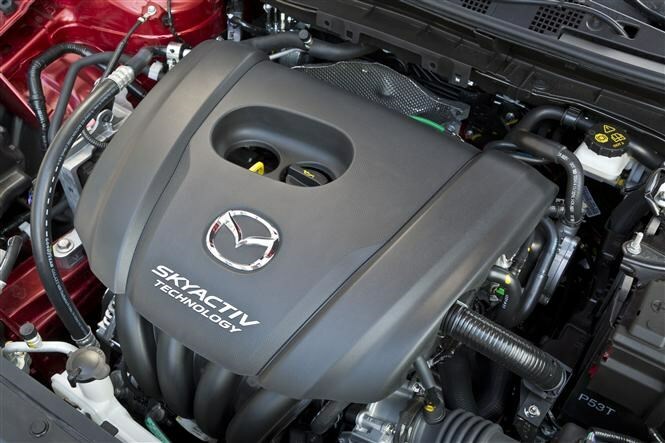 There’re three outputs for the 1.5-litre Skyactiv-G (G for gasoline) i-Stop engine, from 74bhp through 88bhp to 113bhp, though the middle model will sell most here. It’s a smooth and willing performer, with sharp responses - thanks to a trick exhaust manifold and world’s highest compression ratio - and a 0-62mph time of just 9.4 seconds. Flying further in the face of convention, our time with the 1.5-litre diesel proved the most entertaining. There’s a smattering of diesel-engine grumble, but its 103bhp and generous 220Nm of torque (from 1,400rpm) combined with an eagerness to rev ensured it felt the most lively of the lot. Special pistons sharpen the response, while the trick turbo speeds up the engine’s warm-up time. Equally impressive is the claimed 83mpg and 89g/km of CO2 output. We only sampled the five-speed manual gearbox, and even then our inner-city tour didn’t see us select anything higher than fourth, but it shifts smoothly and cleanly. 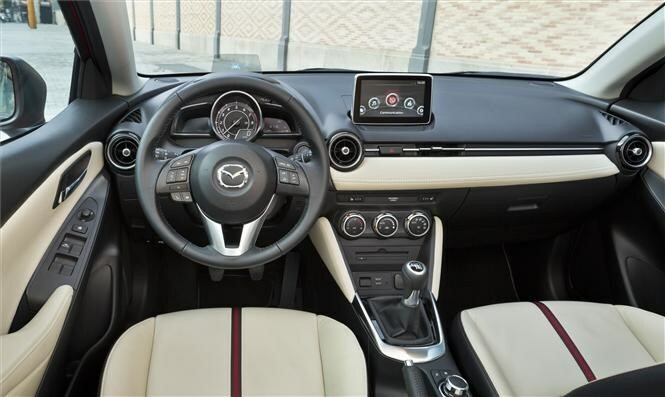 Mazda of course claims it’ll slice through the gait with the precision of its MX-5’s fabled lever. 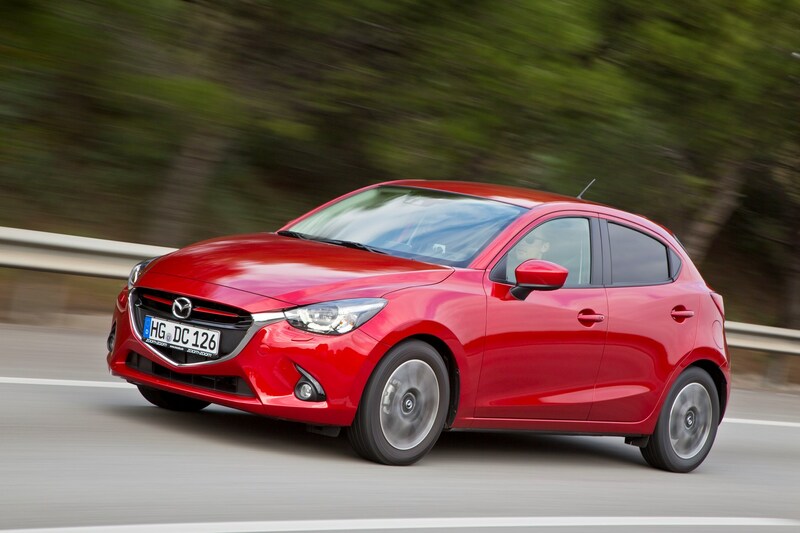 Traditionally function-led (think of shrunken people carrier look Nissan Note or Honda Jazz) Mazda’s designers sketched a different path for its new supermini. A stretched wheelbase, wider tracks and an windscreen-pillar moved rearwards by 80mm creates a ‘pouncing motion’ (their words not ours) and a sportier silhouette. In most areas it works, and the extra prominence afforded to the signature wing grille and bird of prey-inspired headlights lend the 2 a more distinctive, almost menacing. Being picky the wheels look a bit small for the body and, just occasionally, the detailing is more dumpy than desirable. 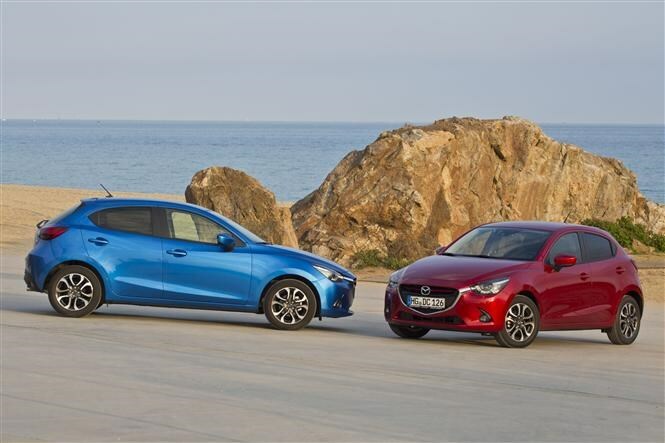 If you like the look of the Mazda 3 you’ll be perfectly pleased with the 2 though. An over-indulgence of carbon fibre style material isn’t just reserved for the headlight innards though, as the weave has been applied all over the cabin. So prolific is its application it could be mistaken for a teenage-fuelled aftermarket modification, but it’s not. Aside from some hard plastics that’s as far as the cabin’s criticism list stretches though, as the rest of the interior is something of a standout feature. Instruments, with a central rev-counter, lifted from the 3, focus on the driver while a broad spreading leather panel from steering wheel to furthest tip of the dashboard to break convention with dash layout and further a relaxed cabin ambience. 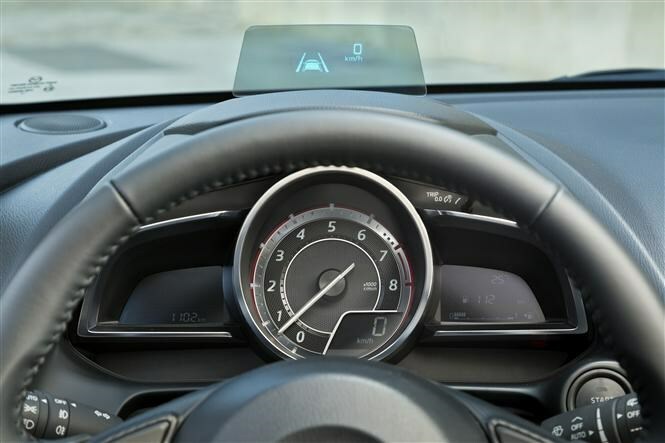 The tablet-like seven-inch screen atop the dash is standard here in the UK, though the head-up display (HUD) is yet to be confirmed. Download the correct app and you can even bark Facebook statuses while driving, using the car’s voice control, and post on the move. Otherwise you’ll operate it with a central Commander control while driving, and a touch-screen interface when stationary, while the HUD projects up to three separate items of information at any one time. Sitting in the back your knees will notice the front chairs are exceptionally slim, while those in the front will likely be oblivious to them re-creating the natural posture of someone experiencing zero-gravity weightlessness. Regardless of science they’re comfortable and appreciatively low-slung, though the rear door aperture is on the narrow side for adults and the 280-litre boot is hampered by a hefty load lip. UK specifications haven’t been announced (the car comes here in spring 2015) but the 2 offers a raft of safety kit under its i-Activesense umbrella including pre-crash and active technology. 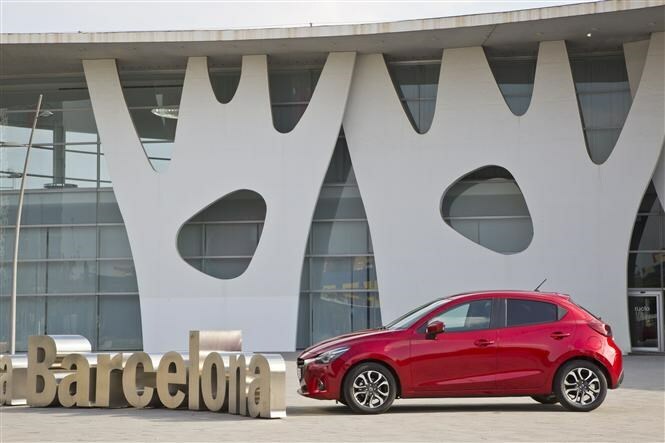 Smart City Brake slows the car to a stop without drive input, while pre-filling the brake system in anticipation of an emergency stop means the system can avoid collisions at up to 12mph. High Beam Control, usually the reserve of cars from classes above, switches between dipped and full beam headlights automatically while the Blind Spot Monitor detects vehicles up to 45 metres away and warns of those within seven metres. It’s also the first Mazda to offer full LED headlamps. Ten different colours are available while the cabin’s style collection allows users to customise interior ambience with a choice of colours, materials and a finishes. Radically different it doesn’t look (in fact it looks like a scaled down 3 – no bad thing) but the 2 has leapt ahead of its predecessor in terms of comfort, kit and response. It remains a slightly oddball individual choice though, and projected prices of between £12,000-18,000 mean it’s not going to be the cheapest in the segment either. 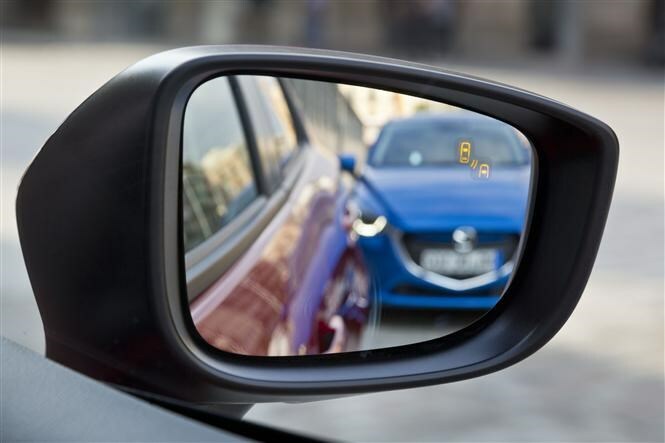 But then that’s the point; Mazda knows it’s a small company that can play to these strengths and anyone who takes the same leap of faith will enjoy a car that can genuinely challenge the class-leaders for honours.